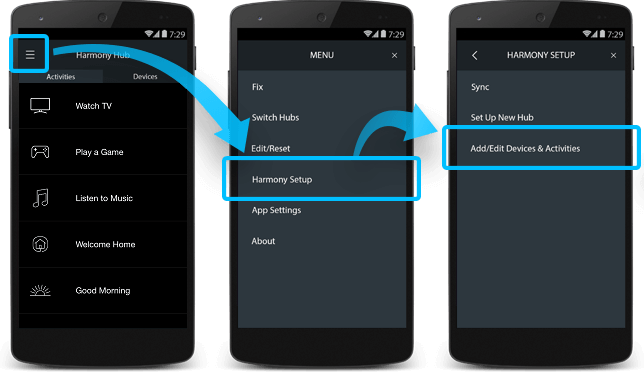 Harmony Smart Keyboard has default command assignments for each of your Activities, Harmony allows you to customize many of the keys. Key customization settings are unique for each Activity. For example, you may have the colored buttons assigned to your game console in your Play Game Activity, and then assigned to your DVR controls when in your Watch TV Activity. This article is only relevant to Harmony Smart Keyboard. Next, select KEYBOARD & HUB > HARMONY SMART KEYBOARD. Select the Activity and key or key combination that you want to customize. Assign a function to the key or key combination, then tap Done.